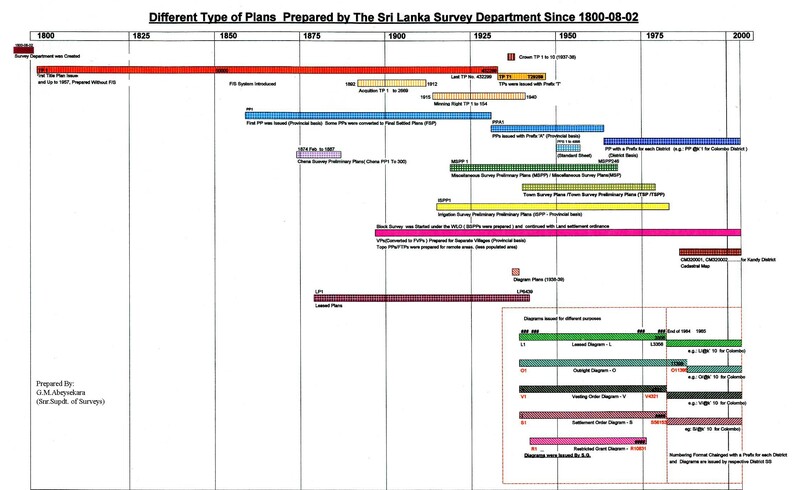 As the oldest Government Department of Sri Lanka, established on 2nd August 1800, the Sri Lanka Survey Department (SLSD) is the National Surveying & Mapping Organization pioneering the fields such as Land Surveying,Mapping, Satellite Remote Sensing (RS),Global Positioning System(GPS),Geographical Information Systems (GIS), Land Information Systems (LIS), Airborne Remote Sensing and Photogrammetric activities in Sri Lanka.Those fields were become more IT contributed fields today as the fast development of ICT technology related to those fields, the department drive towards new direct to increase it's efficiency. Presently, the department is well equipped with latest technology. The strength of the department is exceeding about 6000 staff including technically qualified and dedicated personnel in above fields. Surveyor General is the head of the department and head of the Surveying and Mapping profession.He is the Chairman of the Land Survey Council (established under the Survey Act No: 17 of year 2002) which having legal mandate to regulate private Surveyors in Sri Lanka. During the last 218 years, under the leadership of 46 Surveyor Generals, as the National Surveying & Mapping organization and as an initiative activator in any land development activity of the country, Survey Department has earned much acclaim for preparation of plans, maps and Land/Geo Information in high quality using up to date technology available.